Yet another weekend passes by, I drink too much and mix it up too… Beer, wine and spirits. It’s toxic, and I pay for it on Saturday morning. A good gym session sorts this out as far as is possible. I can feel the toxins dripping down my face as I drive them out of my body by red-lining it with kettlebells and a good cardio session on the cross trainer. I like the equlibrium of feeling healthy, so I couldn’t possibly enjoy a hangover cure until I’d paid for Friday night’s indiscretions. I celebrate the conquest of my hangover by getting a good nights sleep on Sunday, the kind of deep sleep you only get once in a while. The next morning I wake with a taste for Sunday morning bacon! Streaky is all I have so I roast it slowly in the oven. After around 40 minutes I cannot wait any longer and eagerly clank the grilling plate out of the oven. The bacon is so brittle you can hardly handle it, dripping in roasted brown bacon fat. The smell is un-beatable, anticipation towers above me, urging me to chuck 2 pieces into my mouth before they even meet the bread. I pile it all into 2 small pieces of freshly toased rye with no butter, but a touch of tomato sauce. I bite in. 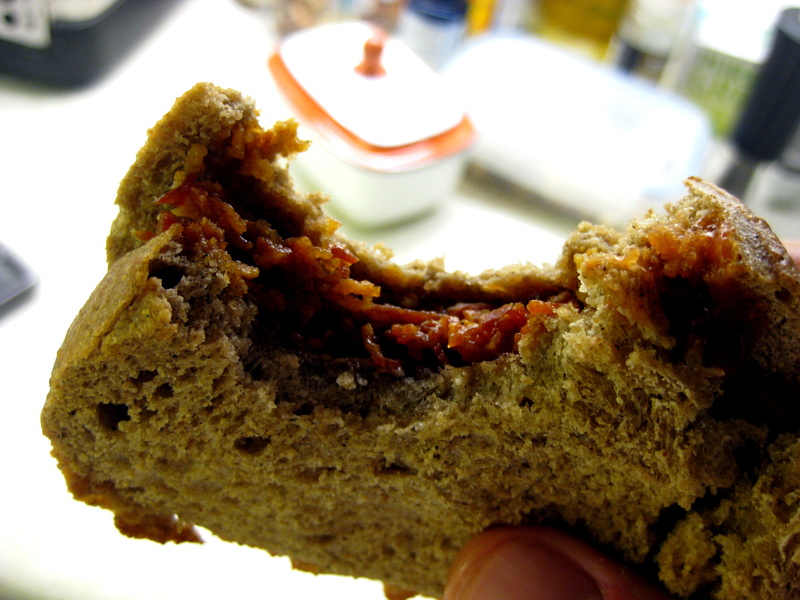 Soft bread and brittle crunch of bacon. The best hangover cure. Next Next post: Wild mint and honey on an autumn day.